I’m super excited to share this guest giveaway with you! Rosebud Lips is offering one of her Sophia Rosebud Brooches for one Happy Together reader. Isn’t it just beautiful? Even though it’s a brooch, you could also pin it to a headband and make it a hair piece! Her creations are just so pretty and so are the pictures of her products! “ I’m 26, and a dreamer. I am a stay at home mommy in The Woodlands, TX, and love to do what I do. To tell you why I became a designer would have to be because of my sweet memories of being a little girl (about 4) and dancing around in my Nana’s silk bed sheets (my cape), adorned with her costume jewelry. I felt like a princess. My Nana has collected jewelry from my family generations back, and I felt like each piece had a story. This inspired me to use antiques in my pieces. I love textures, antiques, fabric and jewelry. Together, these form my concepts for my collection– Making every woman feel beautiful. I started the company in 2009, shortly after my mom passed away from Cancer. She was my best friend, and my biggest supporter. She was an artist herself, and she told me to follow my dreams and be creative. This motivated me to leave the marketing/PR world that I worked in for over 5 years. She has changed the course of my life, and I’m so excited for what the future holds. The name Rosebud Lips was actually the nickname that she gave me when I was little, then my little girl (her grand daughter). For a chance to win, visit her shop and leave a comment with at least one thing that you find beautiful. 1. If you follow Happy Together, leave an additional comment saying so. 3. Follow Lauren’s blog and leave a comment saying you do. This will be open for two weeks- last day to enter is March 6, 2010, midnight EST. Winner will be randomly selected. Oh my goodness, her stuff is gorgeous! Sheer eye candy! I love her necklaces although I think everything in her shop is stunning! Sophia Rosebud Brooch.Hairclip… soooo CUte! That vintage garden hat is too cute! I love the simplicity and flexibility of the single rosebud clips. I’m not much of a headband girl, but think the Kelly Green Rosebud headband is pretty and fun! i am in love with the The Vivian Rosebud Brooch and the shabby chic headband! I just adore the bridgette satin rosebud…so cute! Beautiful flowers! 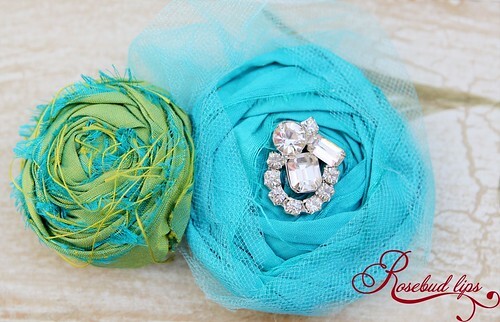 I really love the aqua vintage diva rosebud headband. So pretty. The Punk Diva Rosebud Necklace and other bib necklaces are awesome! I still think the Sophia Rosebud Brooch is probably my fav. I’d love to see one in red/magenta 🙂 THanks for sharing another creative inspiration! I think the punk diva rosebud necklace is beautiful! and the giveaway one is just beautiful! I follow rosebud lips blog! ALL her items are fabulous! The Punk Diva Necklace is one of my faves!! Thanks for offering the giveaway. If I told you the things I liked from her site, it would take ages because I love them ALL! If I have to pick some favorites though… I love the Mercy Rosebud Brooch in turquoise and the Terra Rosebud Brooch in cream and the Sophia Rosebud Hair Clip. I follow your blog! Thank you for introducing me to this amazing etsy store! I’m now a happy follower of Lauren’s blog! Wow! There’s so much to choose from! I love it all! I really love the bridal bouquets!!! GORGEOUS!! I so wish I could have had one when I got married! What beautiful items. It’s hard to just pick one thing that I like. But I really love the Isabella headband. So elegant and pretty. I follow Lauren’s blog now too! I think everything is beautiful! The garden beanies are so sweet so they would be my favorite. I tweeted the giveaway, not sure how to do a dirct link. I love the headbands! They are so amazing! I love reading your blog – I’m a follower! What an awesome giveaway! Honestly the most beautiful thing I see is Lauren’s dedication to changing women’s lives with Set Hope Free. But I’m sure you’re refering to a broach, so my favorite is the Bridget Satin Rosebud. 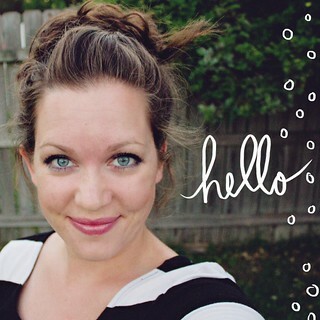 Thanks for the intro to Lauren’s blog, just became a follower! Oh my goodness.. so beautiful! I love the Rosebud Headband-Set Hope Free!! I’m already a follower of your blog. SOOO in love with the Evelyn Rosebud headpiece. Absolutely stunning! Wow, am I really the first to comment? I LOVE the brooch, the colors are very “me”, lol. She has so many beautiful things on her website it is hard to choose, but I love the Rosebud Petite Headband- Set Hope Free, I love how subtle it is. I love the sweet and sassy headband. All of her headbands are quite fun, and I think I would try pinning this to a headband too! I follow Happy Together. Love your site! I’m always inspired!!! Her stuff is so cute. I’m finally pregnant with a girl (after 3 boys) and I am just so excited about cute things like this – for both me and her! I really love the Hope Rosebud brooch/hairclip. So cute! The gumball craving clip is really cute! four words: punk diva rosebud necklace. so gorgeous!!! her stuff is awesome. can’t wait to see if i win! i love it all, especially the Mercy Rosebud Brooch or Hair Clip- Set Hope Free. I love the vintage garden beanie hat!!! Awesome stuff!!! Wowza! I adore the Etheral Rosebud headband…but I don’t want to stop there! Everything is TDF! I am a Happy Together Follower! LOVE the bridget satin rosebud!!! I also follow Lauren’s blog! Oh my gosh! So many beautiful pieces! I just love the Mercy Rosebud Hair Clip! I take flowery, feathery clips and brooches to work every Friday for my co-workers to wear~it’s a great way to celebrate the end of the week! I follow your blog thru google friend connect.. I just visited her shop and am in love with it ALLL!!!!! Everything is gorgeous – but I think I may have to order the Olivia Rosebud Headband for my daughter – too cute! I am a follower of Happy Together and now of Rosebud Lips as well!! Oh my gosh…she has so many beautiful things. I would have to say that Mercy Rosebud Brooch or Hair Clip- Set Hope Free is my favorite. I love the Evelyn headband…gorgeous blue colors! I’m a Rosebud Lips follower, too! The Punk Diva Rosebud Necklace- Romance- 2010 Collection of Set Hope Free is so lovely and beautiful. I love the Walk on the Wild Side Rosebud Headband! Facebook fan of Rosebud Lips. How can you choose just one? Do you choose for your little girls (headbands) or lust after a gorg necklace for yourself? Tough choice!! My favorite is the Punk Diva Rosebud Necklace. Rosebud Bridal Collection is very pretty. I would choose the Ophelia Rosebud Brooch. Cute!!!! Thanks! Love the Punk Diza rosebud necklace!!! What I love most is the support for such an important cause that often gets overlooked in the wake of neverending natural disasters. Set Hope Free sounds like a fantastic project. love her shop! Especially the Bridget Satin Rosebud and the lovely Punk Diva Rosebud Necklace. thank you for the chance to win! ALL her items are fabulous, I love her Antoinette Rosebud Brooch or Hair Clip, I also follow your blog. Can I just say that I love everything with the name rosebud? No? Ok, I love the Evelyn and the Marliyn. Gorgeous things and I love that there is a huge selection of hair things, jewelry, and other items. I love the rosebud blue and pink headband. I have so much pink in my wardrobe and now a lot of pink accessories. Yes, I follow your Happy Together blog; thank you for sharing the shop link to Rosebud Lips. She has such great product photos in her Etsy shop. I think that is what truly draws people in. Lots of closeups and gorgeous colors. Wow lots of awesome stuff! The cameron rosebud clip caught my eye though! Over the Rainbow Bib Necklace!!!! I also became a Lauren’s follower! I love the root beer float necklace. I love the shabby chic rosebud frame!! Ooh, pretty stuff! I can’t decide between the beaded necklace or the punk diva necklace. I love either the Punk Diva rosebud necklace or the Duchess Rosebud necklace. Beautiful work. Wow, thanks for sharing! There are so many lovely rosebuds! I think the bouquets are a darling idea. I would feel beautiful in the statement bib necklaces or the Hope Rosebud Brooch. What a beautiful story too! And I follow you through google reader. Love your blog! I love Rosebud Statement Bib Necklace. It’s really beautiful! Hope you are doing well girl, and don’t consider this spam. I just figured I would comment instead of emailing you. If it bugs ya, no prob. My feelings won’t be hurt if you delete my comment! Wow! Thanks for sharing her with us! I follow Happy Together! I am following Lauren’s Blog! Posted this giveaway on my FB page and Twitter! I’m also following yours and Lauren’s blogs. I’m following both of your blogs. They are amazing! The Shabby Chic Rosebud Headband is my favorite. I just love the colors. So adorable! Everything is so beautiful in the shop. I had a hard time picking out my favorite. But that would have to be the Evelyn Rosebud Head Piece. And I’m following both blogs. I’m also following both your’s and Lauren’s blogs.